GLOBAL: Successful brands allocate 13% of their media budgets to out of home advertising, while the channel’s share of global display adspend has remained stable over the last decade, according to a new analysis of the sector by WARC Data. February’s Global Ad Trends report, which works from media channel data in 96 countries and detailed findings from 12 key ad markets, also shows that the heaviest OOH spenders were government and non-profit campaigns, which committed an average of 26% of total budgeted spend. Alcoholic drinks brands (16% of budget) and retail brands (14%) were also among the core investors. Data show that the cost per thousand (CPM) for billboards is routinely below the all media average, which helps explain why successful campaigns within the low (up to $500k) and medium ($500k to $10m) budget bands are the ones that allocate the highest proportions towards out of home. The latest verified data show that OOH adspend amounted to $31bn in 2016, a 5.8% share of the global total. Preliminary estimates for 2017 put spend at roughly the same level. Excluding search, classified, and other spend, OOH accounts for 8% of the global display ad market. Digital is growing rapidly in the sector. Data show that digital’s share of total global out of home advertising spend reached 34.8% in 2017. By 2021, digital’s share is expected to rise to 45%. Explaining the figures, WARC’s Data Editor, James McDonald said, “Out of home is an industry staple, attracting a consistent share of successful brands’ budgets over the long-term. 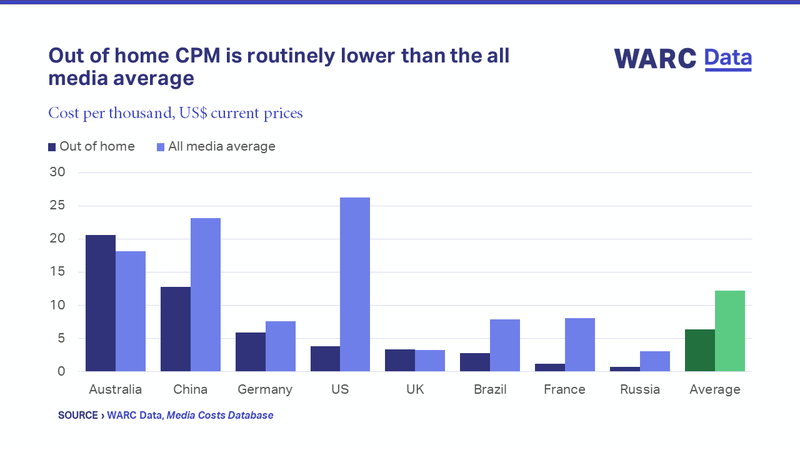 The channel delivers affordable reach with CPM routinely below the all media average. However, his analysis found that brands must tread carefully in integrating such new technologies for marketing purposes. A recent WARC and Toluna survey in the UK found that 65.8% of shoppers are open to the application of facial recognition in store for products and services, but the majority (65.2%) do not find the idea of its application for personalised messages appealing. “New tech, such as facial recognition, is being tailored to improve shopper experience, but advertisers need to heed consumer concerns”, McDonald warned.